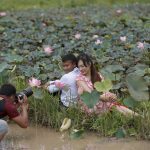 Nowadays, many brides and grooms in Phnom Penh like to take pre-wedding photographs to display at their wedding reception. The Ministry of Interior has ordered National Police to investigate a scam in which unidentified callers claimed to be senior officials at the ministry and the Anti-Corruption Unit (ACU) in an attempt to extort money from district governors, according to a letter issued on April 1. The country’s second most senior border affairs official on Sunday warned against oversimplifying territorial disputes after opposition leader Sam Rainsy claimed that Vietnam has flagrantly annexed land on Cambodia’s side of a demarcated border area in Svay Rieng province. From certain angles, Trach Tol looks like any other Cambodian village. There are a handful of brick houses, a tiny pavilion where religious ceremonies are held, and not much else. Gleaming rice paddies stretch out in all directions. Wedding music rumbles in the distance. But turn around, look more closely, and the holes come into focus. Information Minister Khieu Kanharith said Sunday that he supports the prosecution of social media users who insult government officials, after a government spokesman requested such action last week in letters to the ministries of interior and telecommunications. The National Police will launch its own 12-page color daily newspaper on Saturday, its editor-in-chief said Sunday, with the first issue marking 70 years since a national police force was created under Japanese occupation. Seventy families in Stung Treng province on Saturday officially accepted the government’s offer of new land in compensation for the farms they will lose to the under-construction Lower Sesan 2 hydropower dam, becoming the first group to agree to the deal. Sixteen Cambodian students studying in war-torn Yemen were scheduled to fly out of Oman’s capital, Muscat, late Monday night and were expected to arrive in Phnom Penh at 3 p.m. Tuesday. Koh Kong Sugar has offered to settle its yearslong dispute with Cambodian families who accuse its plantations of stealing their land, but the farmers remain wary of being able to secure a fair deal. A Stung Treng province district official on Sunday contradicted claims that logging in the area designated for the Sesan 2 dam had ceased a month ago, saying that it had only stopped last week after direct orders from the government to do so. The National Committee for Disaster Management and the U.N. Development Program have launched Cambodia’s first comprehensive database for tracking the progress of natural disasters such as droughts and flooding. Prime Minister Hun Sen has appointed 21 people as personal advisers and a further 34 people to the rank of personal assistant, according to a Royal Decree signed by King Norodom Sihamoni on Friday. Defense Minister Tea Banh on Thursday said that truckloads of tanks and mounted rocket launchers seen by witnesses leaving the Sihanoukville Autonomous Port in the direction of Phnom Penh would be used to protect the country in the case that someone “tries to destroy the nation". Interior Minister Sar Kheng wrote to CNRP president Sam Rainsy on Wednesday, asking that any potential opposition demonstrations be confined to Phnom Penh’s Freedom Park. Returning to the park where a grenade attack killed 16 of his supporters in 1997, opposition leader Sam Rainsy on Tuesday spoke at the stupa in central Phnom Penh that memorializes the men, women and children who were murdered in one of the biggest single cases of violence against civilians since the Khmer Rouge. 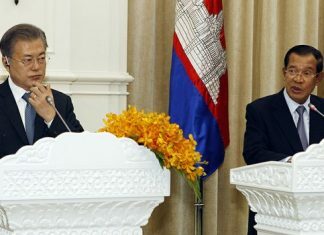 Cambodia National Rescue Party President Sam Rainsy said Saturday that his party would await the results of Sunday’s election from the National Election Committee before deciding how the opposition will respond to what he described as the systematic “unfairness" of the electoral process. With Cambodia National Rescue Party president Sam Rainsy’s political fortunes on the mend following his Royal Pardon, those of his vice president, Kem Sokha, continue to head the other way ahead of the July 28 election. Japanese sports brand ASICS has agreed to pay compensation to the families of victims who died in a factory collapse in May, a brand representative said.